I have a horrible feeling there will be plenty of younger science fiction readers for whom the names of Frederik Pohl and Cyril M. Kornbluth mean nothing, but for those of us of a certain age they are among the greats. 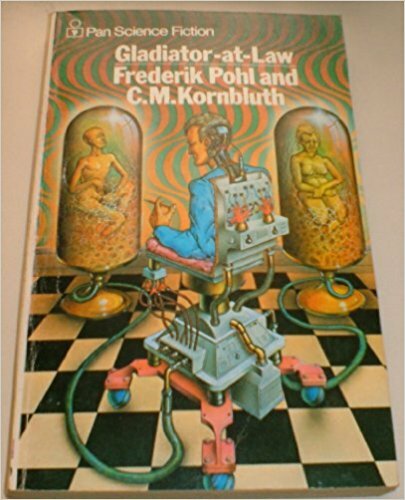 I've just re-read this classic title, Gladiator-at-Law. It's over sixty years old (I see on Amazon.com you can buy the June 1954 Galaxy Magazine part of it first appeared in), and yet apart from a few niggling details, it is as fresh as ever. This bread and circuses dystopia, with an early focus on the dangers of corporations and lawyers having too much power is superbly crafted. It's a page turner, but thoughtful as well. Those niggles? There are inevitably technology flaws - in this case, most notably the use of microfilm to store data. And, as is common for writing of the period, the female characters mostly fit within limited stereotypes (although some of the younger female characters are pretty violent). While you can argue also with aspects of the embedded morality tale, the fact is that this book does everything you want from good science fiction, at a tremendous pace and with lots of content. I don't want to give too much away, but I can almost guarantee it will exceed expectations - and where some themes may now seem quite familiar, chances are they were novel at the time, because this was pretty much groundbreaking stuff. At the time of review it's out of print on paper, so links are for secondhand books.